I had a conversation over the phone with a B&B owner who said all their rooms were for two people sharing. I said I was fine with that but they'd have to serve me two breakfasts. They hung up. 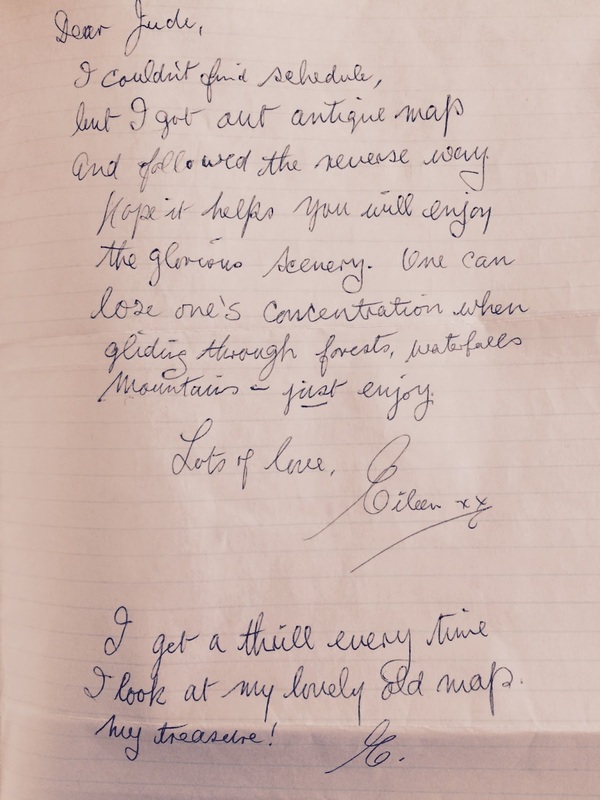 I had Eileen Sheridan's 1954 record breaking map and she very kindly wrote out a list of all the places she passed. This was my guide on where to stop. I loved my route and saw so many things that I didn't bother taking pictures off because it wouldn't have done them justice and I'll never forget actually seeing these things with my actual eyes. Maximum respect to those who do this camping. I didn't even entertain that idea because I already thought I was carrying too much. I always say you should should have a £1000 emergency saving in case you want to go on an adventure or in case you break up with someone and need to leave the country. I saw this adventure as my annual holiday so I took my sweet time and didn't scrimp massively. I spent less than £1,000 in the whole three weeks but you could definitely do this on a much tighter budget. First I needed to get to John O'Groats. I took an over night Caledonian Sleeper Train from London Euston to Inverness that left at about 9pm and arrived in Inverness at about 8am. I'm only 5'3" and have had extensive training sleeping on coaches from travelling in South and Central America and Mexico so didn't bother paying for a bed. My ticket was £50 and there were just six of us cheapskates in the seated carriage. At this point i'd like to thank Margaret MacDonald for not turning up to her reserved seat next to me so I had space to lie down. Bring a blanket or towel as it can get cold in the night. From Inverness I got another train to Wick for about £20 which took ages but I got to see where I'd be cycling from a different perspective. I went to Euston a few days earlier to pick up my tickets and reserved spaces on both trains for my bike. At John O'Groats I checked into the B&B, ditched a pannier and cycled the 16 miles to John O'Groats to begin my journey. I recommend downloading the Hostelworld and Booking.com apps so you can easily look for places to stay. I didn't bother with weather apps or ones that told me how high hills were because I didn't want to know. I only planned and booked accommodation for the first six days up until Edinburgh. Then I played it by air and cycled until I felt like stopping. Every morning over breakfast I would plan my rough route using google maps and make some notes. I used a mixture of NCN cycle routes and A roads and got to where I needed by following road signs and checking my iPhone if I was desperate.I had GPRS signal everywhere so the blue dot was always with me (that's probably a whole other blog post). £35. Indoor, locked bike storage for up to 10 bikes. My first Full Scottish Breakfast that went towards fuelling me through the headwinds. £30. Indoor, locked bicycle storage for many bikes. I had breakfast with some truckers who offered me a lift and swore they'd never tell. Then they started talking about all the times they had fallen asleep at the wheel. Tempting, but no thanks guys. £17 for bed in dorm. Bikes can be locked in the locked garden. This is where I met two kids who were doing LEJOG and had an uncle driving their stuff and buying them food. JEALOUS. £15 for a bed. I loved this place. It's in the middle of nowhere. I think I was the only person in the village that night. £30. Indoor locked bike storage. These guys are so sweet, they even gave my bike a bit of clean. £15 for a bed in a dorm. You can lock your bike to the railings in the courtyard just outside the 24 hour manned reception. I try and get in the female only dorm because I didn't bother bringing pyjamas. DAY 7: Rest day in Edinburgh where I did everything but rest. £40. Locked, indoor bike storage. Beautiful building next to an old mill. Also the site of the world's biggest ever bike shed key ring. £35. Locked, indoor bike storage. A tiny village where everyone knows each other. Everyone in the pub below my room made me feel very welcome. £33. Kept bike inside in reception room. 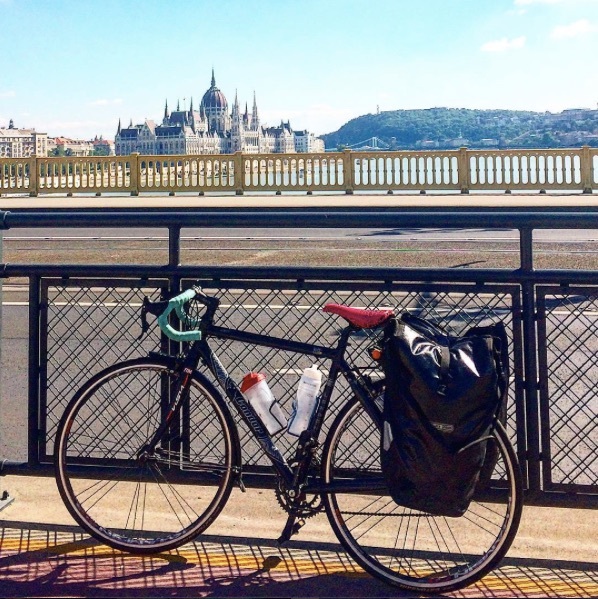 I stayed with friends and wore all their clothes because I was already so bored of what I crammed in my panniers. DAY 12: Rest day in Kendal with friends carb-loading. DAY 13: Another rest day. My friends and I did the Great North Swim in Lake Windermere. Again, not quite getting the point of rest days. Travelodge, PR1 5NX (I was desperate). £42. Kept bike in room. I was only supposed to go to Lancaster but got carried away and ended up here. £15 for bed in dorm. Locked, indoor bike storage. This place is special to me because it where I invented the Marmite, peanut butter and Nutella sandwich. Travelodge, WR1 2QS (I was desperate again). £52. Kept bike in room. I was supposed to stay in Gloucester but after a treacherous day cycling and mild sunstroke I thought about cheating and getting the train from Worcester to Gloucester I saw this Travelodge. £15. Kept bike in reception, 24 hour CCTV cameras. This is the most basic of hostels, not for the feint hearted. I shared a dorm with a bunch of security guards. There was hardly any floor space so I had to sleep with my panniers at the end of my bed. Good job i'm short. £45, Locked bike on railings in front drive. £45. Bike kept in locked garden under a cover. Turns out he owners used to live about a mile from me in London so were the first not to be offended when I asked if I should lock my bike up. Small world. £75. Bike kept in locked cellar. I splurged on my last night so I could have a bath and a dressing gown. World's biggest ever keyring. Wee Row Hostel, New Lanark. I didn't prebook my return train. I just rocked up to Penzance station after I'd been to Land's End and luckily got my bike and I on the train. I would recommend booking a ticket on your way past just before you hit Land's End as it's only ten miles away so you'll have a rough idea of what train you'll make. Train from Penzance to London Paddington £62 (+ £20 upgrade to 1st class to get away from a hen party). Wow - congratulations on making it! What's next? After re-finding this blog I gadnt realised you'd done this. Well done. Really very nice written.This tells the benefits of investing in the student accommodation and everyone should be in the favor of this since at present this is most important requirement of student and their parents when they go outside from own house for study. Very nice description written by you. You indeed enjoyed your traveling. We traveling to UK for Summer vacation. Hoping that we have a good time there. it’s good to be here and read some interesting posts, i got very useful information over here thanks for sharing it . Thanks for sharing the valuable information, it is very useful for the students.Must say its way too impressive, with how everything is explained so exquisitely in detail regarding the Accommodation options as well as the budget/Budgeting techniques to be kept in mind, for the students going Perth. Very Useful and informative. Keep up the good work!